Millions of people use CPAP therapy every night to get a good night's sleep. Most of these people can't sleep well without their CPAP machine, and they rely on CPAP therapy and their miscellaneous CPAP supplies to ensure they wake up in the morning well-rested and ready for the day. A night or two without the CPAP machine can mean days of fatigue and lethargy for these people, as they try to catch up on the elusive sleep they need so desperately. These people rarely choose to sleep without their CPAP machine, but sometimes they have no choice. Power outages - however unlikely - can wreak havoc on the nightly regimen of a CPAP user. Camping trips or long drives or flights can lead a CPAP user to forego CPAP therapy. There are lots of scenarios in which you might find yourself wishing you had a way to power your CPAP machine when a functioning wall outlet is nowhere to be found. If you're a person who can think of a few such scenarios, keep reading. Powering your CPAP machine with a battery is super simple, and it's also pretty affordable. With a CPAP battery, you plug your CPAP machine into a battery pack instead of a wall outlet. Some people envision a battery that gets installed into a specially-designed CPAP machine, but that's not how it works at all. Any CPAP device can be powered by an external battery. 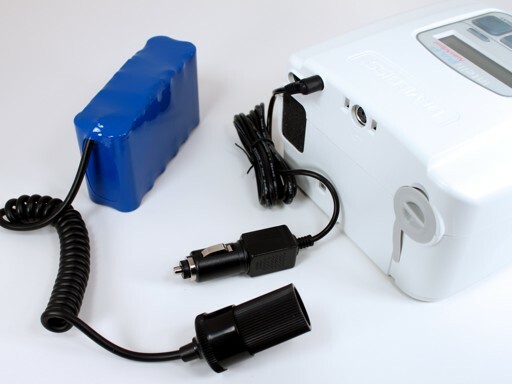 All you need is the battery and the proper cord (or inverter) for your CPAP machine, and you're good to go. We'll get into the details in just a moment. Whether you're putting together an emergency kit for your family, or planning the ultimate backcountry camping experience, a battery for your CPAP machine should be part of the discussion. If you don't like the thought of going a few nights without CPAP therapy - no matter the circumstance - then it's nice to know that you've got a battery backup when and where you need it. When you're done reading this article, you'll know exactly what you need to ensure you've got a reliable power source for just about any situation that comes your way. Your CPAP machine is an electric device that requires a relatively small amount of power to operate. Just the flow generator part of a CPAP draws around 20 to 30 Watts of power at the maximum. Thinking in terms of light bulbs you can see that 20 to 30 Watts isn't all that much. Most CPAP machines are what we call "12V machines", meaning they have a direct DC input jack on the back of the machine. Often, the DC input jack will be marked with a solid line over a dashed line, indicating "direct current". See the picture below. With a machine like this, you'll get the DC cord suitable for your machine and plug one end into the machine and the other end into the 12V outlet on the battery. That's all you need to do. It's really very simple. The DC cord you buy depends on the CPAP machine model you're using. Different machine models have different size DC input jacks, and potentially different pin polarities in those jacks. For example, if you have an older REMstar machine, you would get the REMstar 12V cord. If you have a newer REMstar 60 Series machine, you would get the REMstar 60 Series 12V cord. If you have the DeVilbiss IntelliPAP machine, you would get the IntelliPAP 12V cord. These cords aren't interchangeable. You can't use a REMstar cord on an IntellIPAP machine because the cord won't fit. 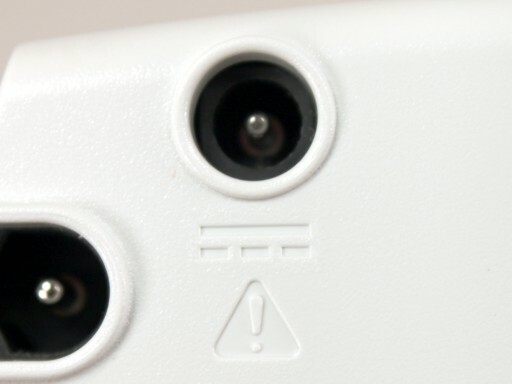 The IntelliPAP 12V cord is shown attached to the back of the IntelliPAP AutoAdjust CPAP machine. Blue battery is to the left. If your CPAP machine doesn't have a DC input jack, you can still use a battery. The setup is just a little bit different. Instead of getting a 12V cord for your CPAP machine, you'll get an inverter. One end of the inverter plugs into the battery with a standard 12V barrel connector, while the other end of the inverter has a regular electrical outlet on it. You'll plug your standard CPAP power cord into this electrical outlet on the inverter. Super easy. The only drawback to the inverter: it uses more power, so battery life gets reduced a little bit. 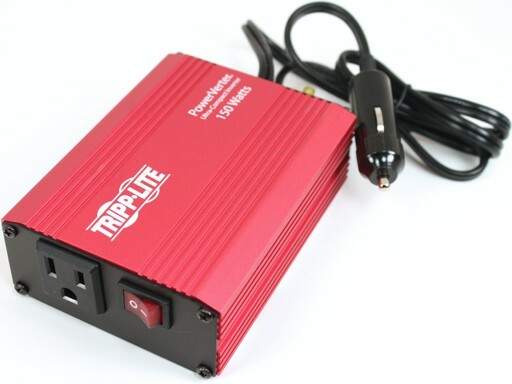 A typical 150W inverter used to power any device with a 2-prong or 3-prong power cord from a battery. Inverter plugs into battery, and device power cord plugs into electrical outlet on inverter. All the CPAP batteries we sell include AC wall chargers, so charging from a wall outlet is straightforward. Likewise, charging from any generator that has power outlets is also very simple. It only gets just slightly less simple if you don't have any functioning 110V outlets. In this case, you can still charge your CPAP battery as long as you have another battery (like your car battery) and an inverter. For example, you can plug an inverter into your car battery - the 12V accessory port or "cigarette lighter" outlet - and then plug the CPAP battery and AC wall charger into the inverter. 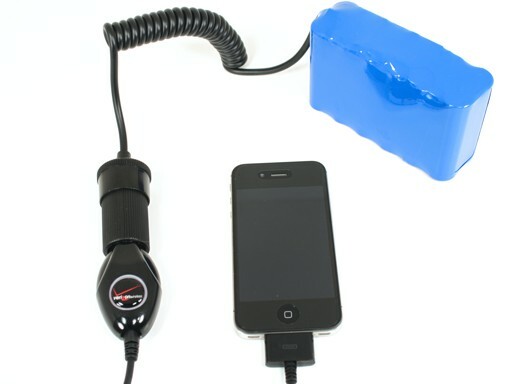 This setup with the inverter allows you to charge the CPAP battery while driving around in your car. You can even charge the CPAP battery while the car is stopped, but just be careful not to drain the car battery too much. Just about any inverter can act as a suitable mobile charging solution. Our 150W inverter is perfectly suited to the task, but if you already own an inverter it'll probably work just as well. Some newer cars have power inverters built into them and have standard electrical outlets throughout the car. In a car like this, you just push the "inverter" button, and then you can plug in anything that has a normal power cord, like the AC wall charger that is included with a CPAP battery. I suppose you could plug in a TV, laptop computer, coffee maker, or anything else, depending on the power limits of the car's built-in inverter. You'll have to check the owner's manual for your car to see what the inverter power limit is. Solar chargers are becoming readily available at relatively affordable prices. While we haven't tested any commercially available solar chargers with our batteries, this method of charging is certainly viable as long as you've got access to direct sunlight for several hours. Solar charging is definitely worth exploring. If I find out any more about it, I'll post my findings on our website. Throughout this article I've been calling our batteries "CPAP batteries", which is a bit of a misnomer. That phrase implies the battery is limited to working only with CPAP machines, but that's not the case at all. The battery can power any portable electronic devices, including cell phones, game systems, GPS receivers, etc. It's a jack-of-all-trades battery. If your device has a 12V cord, just plug it into the 12V receptacle on the battery. And don't forget: with an inverter, you can literally power just about anything with a power cord, as long as you keep in mind battery life and the limits of your inverter. iPhone connected to battery with iPhone charging cord. Low maintenance - lithium ion batteries aren't susceptible to "memory effect", and can be completely discharged without damaging the battery. Slow discharge - lithium ion batteries hold their charge for a long time. Lightweight - our most popular battery weighs 2 pounds. We sell a lead acid battery with similar performance characteristics that weighs 14 pounds. Long life - our most popular battery can go through about 300 charge / discharge cycles before battery life reduction. That's a lot of charging before you'll see any degradation in battery performance. It probably goes without saying, but a universal battery like our little 2-pound lithium ion battery makes a great addition to a household emergency kit. Not only can you power your CPAP machine and get a good night's sleep when the going gets tough, but you can also charge your cell phone, power a weather radio, charge a rechargeable flashlight. If the situation isn't too dire, kids can use the battery to occupy themselves with a handheld gaming device. The applications are almost unlimited. When assembling an emergency kit, don't forget other important CPAP supplies, so you've got what you need exactly when you need it most. If you're looking for a CPAP battery, you've come to the right place. We can help you find the right battery kit for all your needs, even if those needs extend a bit beyond powering your CPAP machine. Give us a call at 1-888-955-2727. We're ready to help you.